Sharra Platt had a problem. 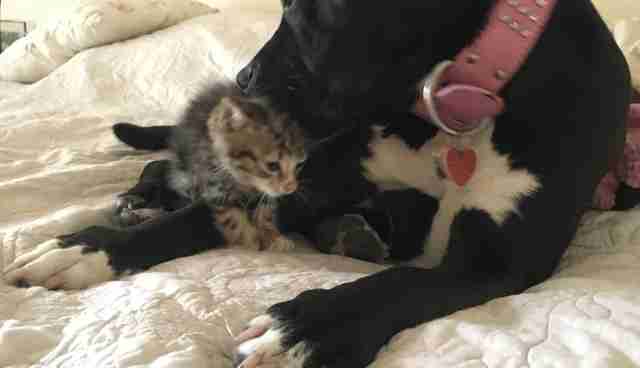 She'd found a 4-week-old kitten on the side of the road, and she wanted to keep her. But Platt wasn't sure how her cat, Lucky, or her Pomeranian, Kasey, would feel about another feline in the house. Platt decided to try. 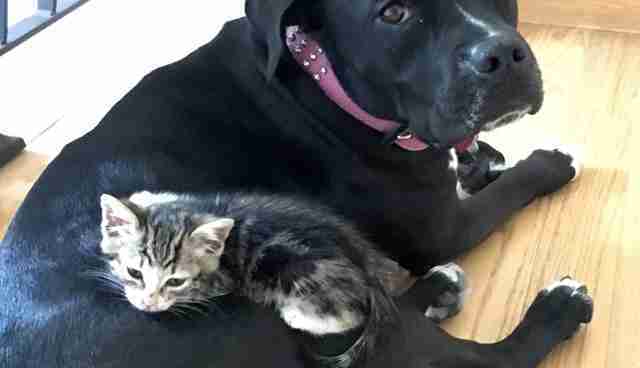 She brought the kitten home, and her black pit bull, Roxy Bardot, rushed up to meet her. This is when Platt's problem got much, much worse. 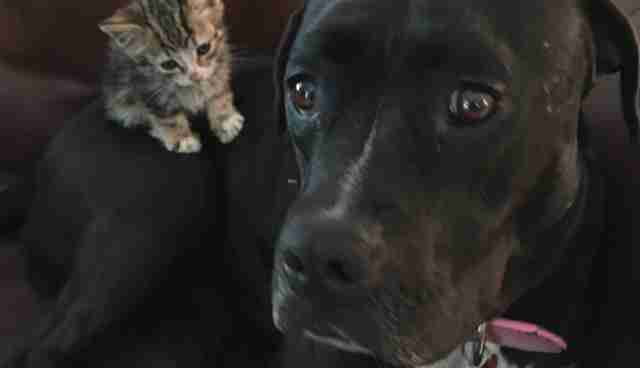 Roxy fell completely, head-over-heels in love with the kitten, and the kitten seemed pretty smitten with Roxy, too. 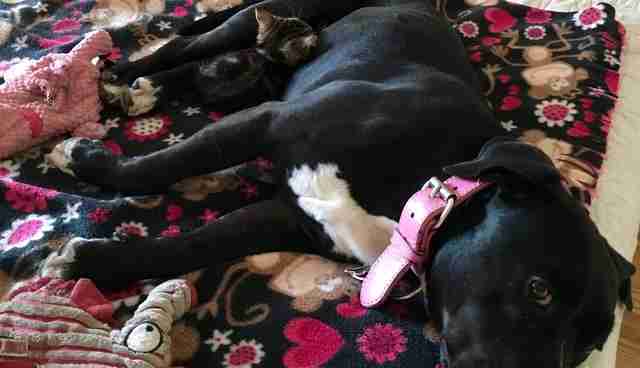 One thing was clear from the start - Roxy wasn't going to let anyone take her baby away. 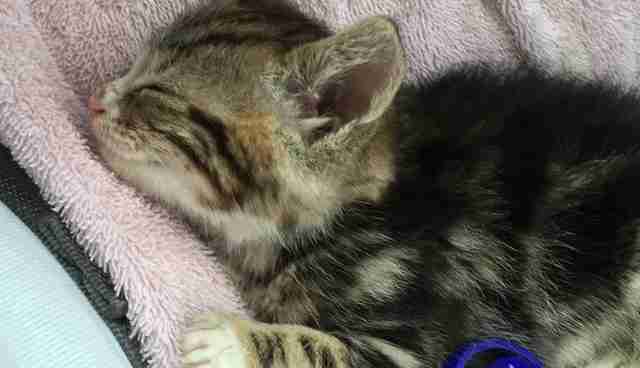 Platt had found the kitten close to the freeway ramp near Crenshaw Avenue in Los Angeles, just a couple feet from the road. The kitten - aptly named "Crenshaw" - was so tiny, Platt might not have noticed her if it wasn't for a woman and her daughter standing on the sidewalk, gazing down at the kitten. "I pulled into a driveway and went up to them," Platt tells The Dodo. 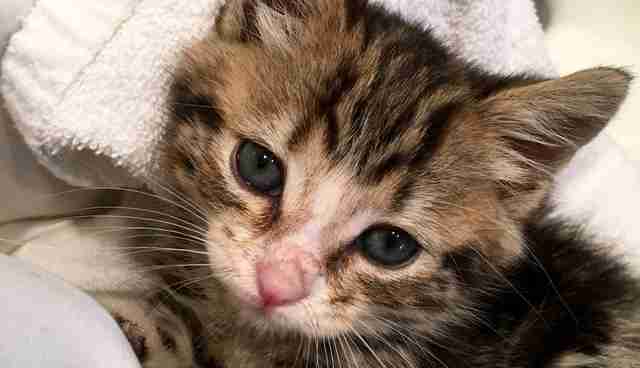 "The woman and her daughter said they'd been looking around for a mama cat and other kittens and found nothing." Platt couldn't leave Crenshaw next to the road, so she scooped her up and took her home. She initially kept Crenshaw in a carrier in the spare bedroom so her pets wouldn't feel threatened by the new arrival. 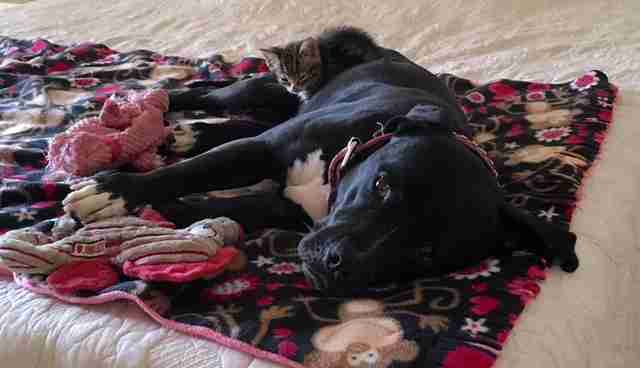 Roxy, Platt's rescued pit bull, had a different idea. Roxy herself had been a stray on the streets of Los Angeles before being rescued by Karma Rescue. 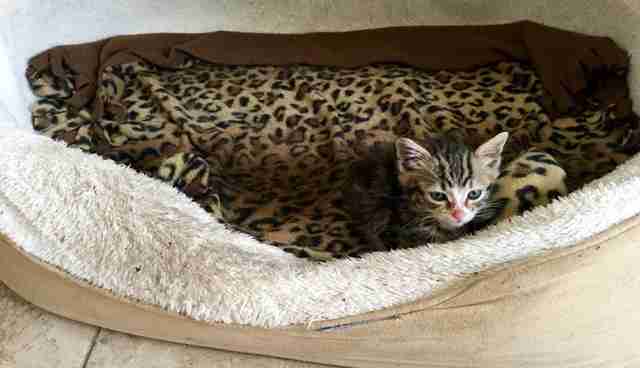 While in the care of the vet, Roxy had been so terrified, she refused to walk for five days. Roxy eventually gained confidence, and is now living a full life with Platt and her husband, but perhaps Roxy's memory of the streets made her so attentive to Crenshaw. "Roxy took to her right away and was licking her and giving her a bath from day one," says Platt. 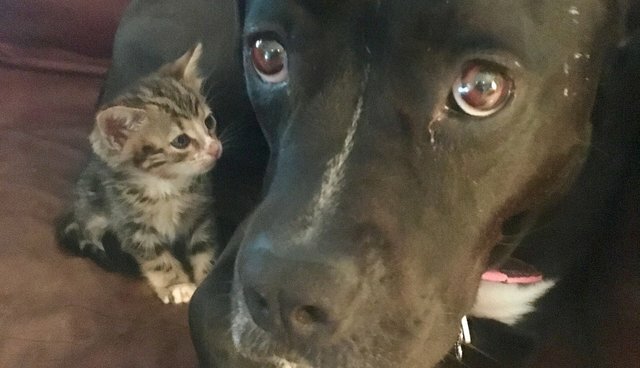 One might think a 1-pound kitten would be intimidated by a 50-pound pit bull licking her, but Crenshaw seemed to like it ... at least most of the time. 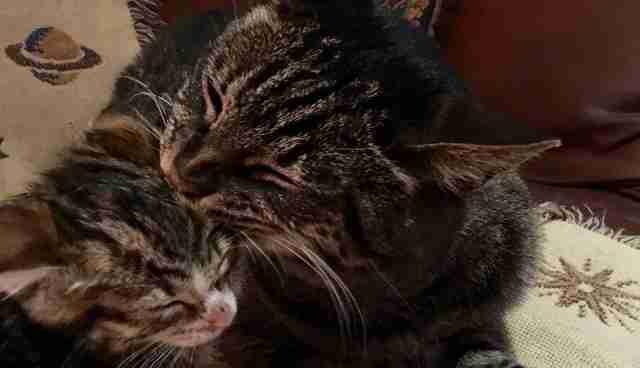 "Roxy nudges her with her nose and licks her, like a mama dog with puppies," says Platt. "Crenshaw likes it, but it can become a bit much, in which case she gives a cry and walks away. She keeps going back though. Crenshaw just wants to curl up next to Roxy or crawl on her. The bath is part of the deal." For Crenshaw, cuddles are better than baths. Roxy lets Crenshaw crawl on top of her, and play with her tail and ears. 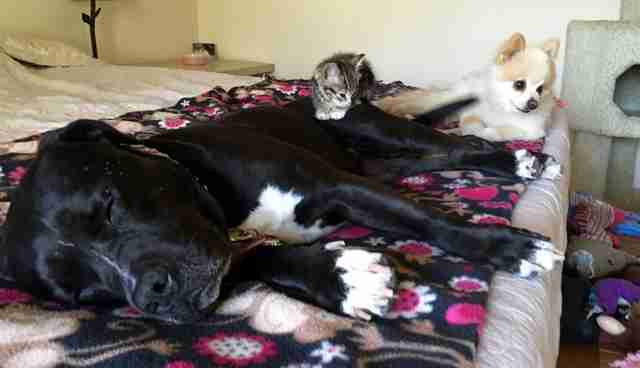 After a few games of "pounce," Crenshaw will snuggle into Roxy's fur for a catnap. "I think she feels comforted being around Roxy," Platt says, "and Roxy's a nice warm place for her to sit." When Roxy's not available for cuddles, Crenshaw will curl up in her dog bed. 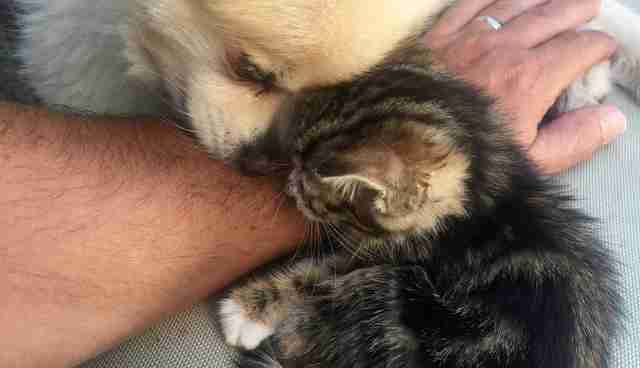 Roxy may be Crenshaw's favourite companion, but she's also been interested in her fellow feline, Lucky. 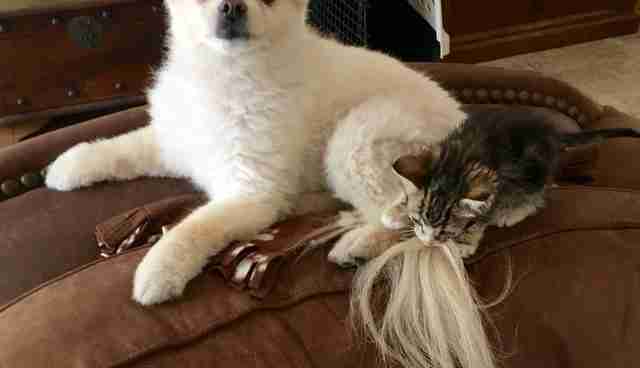 "At first Lucky completely ignored her," says Platt, "but now he is licking her every now and again and puts up with her playing with his tail." Kasey also took to Crenshaw, and didn't appear threatened by the tiny kitten. "Kasey just wants to play with her," Platt explains. "He wants to play on his terms, but he'll teach her." 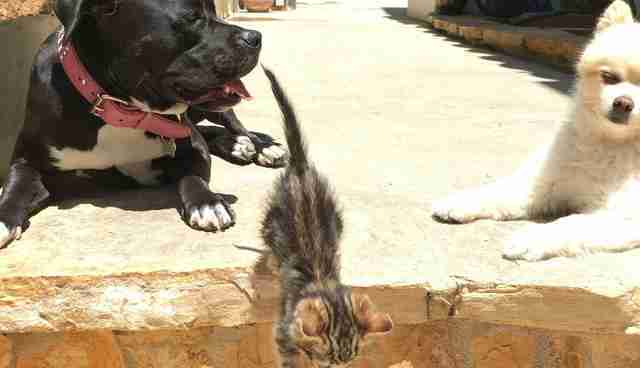 It was a huge relief for Platt and her husband, Glenn, that the animals got along, especially for Roxy's sake. 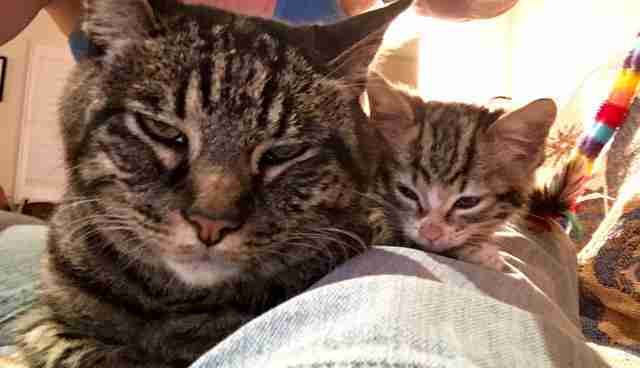 "I think Roxy likes having a little one to be 'mama' to," says Platt. "She's doing a great job and loves it. Just yesterday Crenshaw tried to jump on something and was struggling to get up and Roxy ran over to her. You could tell Roxy was concerned about her struggling." 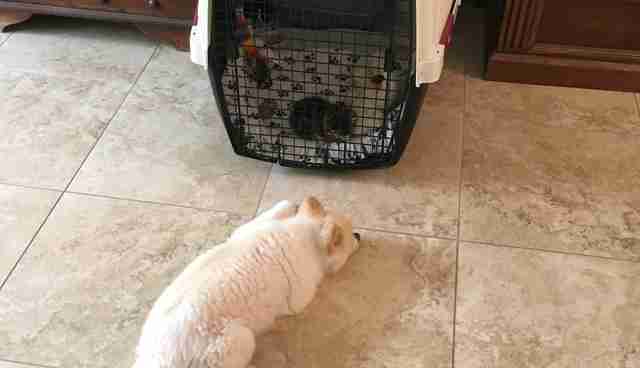 "Roxy is just loving Crenshaw, but honestly, Roxy would do this with any young animal we brought in. She's just a very loving and gentle dog. She already knows Crenshaw's name so if we say, 'Where's Crenshaw,' or, 'Where's your baby,' she gets excited." Sharra and Glenn both volunteer for Karma Rescue, a nonprofit group that rescues dogs and cats in the Los Angeles area, and specializes in pit bull rescue. 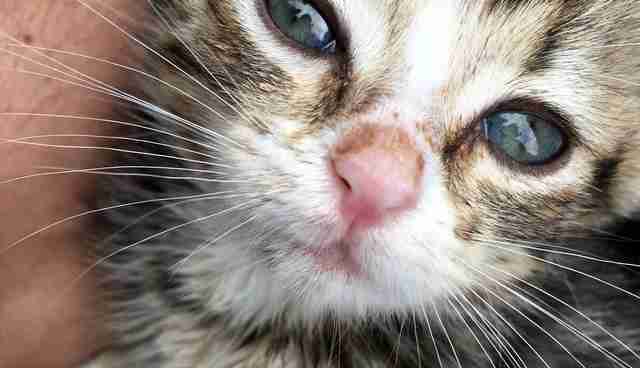 If you'd like to support Karma Rescue, you can donate here.